When preparing an effective accounting manager resume, you want to engage your reader and set yourself apart. The Bureau of Labor Statistics indicates that there will be a 13% growth in accountants and auditors in the decade from 2012 to 2022. To stand alone as the best option, the resume writer you choose needs to go past GAAP, FASB, FIFO and ROI concepts. At the Resume Clinic, we help you communicate impact and aspects of your candidacy that differentiate you from the competition. A hot Accounting Manager prospect is hybrid of accounting knowledge and personnel/project management skills. You want to communicate your understanding of general ledger structure, year-end closing procedures and multi-department cost analyses. But to ensure your resume rises to the top, our resume writer team examines and includes your impact in the areas of cost savings, revenue generation, improved efficiencies and special projects management. Increases in regulations and laws in the financial sector translates into an increase in the need for accounting personnel to ensure compliance. And The Resume Clinic’s team knows how to get aspiring accounting manager prospects to the interview table. In fact, we have been doing so successfully since 1995. Our goal is to develop targeted career document “solutions” that establish you as a leader among the stack of average and mundane documents that most hiring authorities have to review. The private sector isn’t the only place where good accounting managers are needed. Did you know that the FBI employs nearly 2000 accounting special agents to help identify quality data? 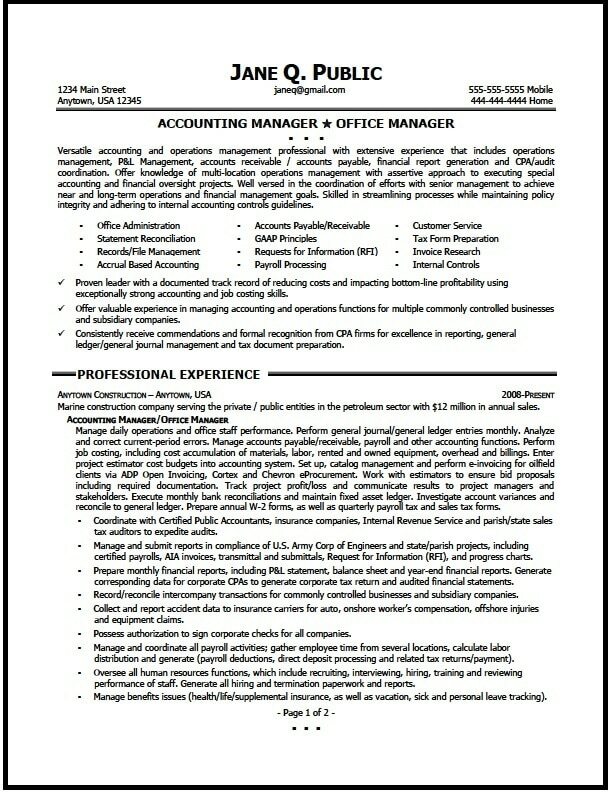 Opportunities are abundant for accounting professionals and a quality resume writer can help you to realize that goal. You work with a certified resume writer trained in identifying the client’s “value propositions” that make the sale to the reader. Every Resume Clinic client receives personalized and attentive service. You have direct phone and email access to your accounting manager resume writer at all times. Our Support Guarantee ensures someone is always in your corner. If you would like to test the waters, send us your old resume for our free resume evaluation. We show you how we will approach the project and you learn how the pros think. Call The Resume Clinic today and let a certified resume writer help you get into the interview door. If you are ready to begin the process, click here to see which package is for you. We offer private sector and federal resume development packages to keep your job search flexible and versatile.